I am excited to announce the release of a new simulation over the American Revolution. When I asked my customers what I should create next, for simulations, the majority wanted an American Revolution Lesson Plan. the founding fathers of our country, I felt had to be the place to start. So the first piece of the puzzle was creating a powerpoint over the enlightenment. I felt that teachers would be able to customize this presentation or use it in pieces to help students understand where these ideas came from. The second piece was a presentation over the American Revolution itself. Again, I thought the teacher could use this presentation in pieces- customizing it to work best for their students. This presentation concentrates more on the revolution and the outcome rather than a big montage on battles. A few key battles are mentioned but most of the content is on how the war got started. The Revolutionary War, as far as the military side of it is concerned, is a difficult task to try and simulate. Some of the key concepts are: The Continental Army and the Militias could not consistently face the British Regulars and win battles. Both had to be very mobile and use innovative tactics to keep the British from destroying whole armies- that is why The Continental Army, Militias and the Royalists have two zone movements compared to one zone for the British and even French armies when they enter the war. The ratings are not in favor of the Americans-which also creates difficulty. The wilderness areas are off limits to battles so that the Continental Armies have a way to escape and out maneuver the British. There are no Naval battles, because the students would just destroy the continental Navy in our gaming scenario. I also added the ability for armies to ambush each other. In this scenario, armies can exact a significant blow and retreat out of there quickly. World War I or otherwise known as the War to End All Wars, started in July, 1914 and ended in November, 1918. But it would not end just there. This was just the beginning to a long journey of reform and recovery. World War I started when a Serbian terrorist, Gavrilo Princip, shot an Austro-Hungarian archduke, Franz Ferdinand, in Sarajevo, Bosnia. How could one single loss of life, have such a global impact? This is what kids need to know. Many were shocked when the start of the war broke out. It seemed to just come “out of the blue.” But was that really the case? Some believe that the seed of war was planted long before that. So what is an effective way to educate kids on the timeline of events and the war itself? This is where the World War I lesson plans come into play. Rather than having kids funneled into a classroom listening to lectures, taking notes off a screen, and reading chapter after chapter in a dull textbook, why not create small scale reenactment? Fortunately enough, that has already been done. The World War I simulation is similar to that of a game. It includes events, stories, and challenges that were faced within the timeline, similar to the real life event. 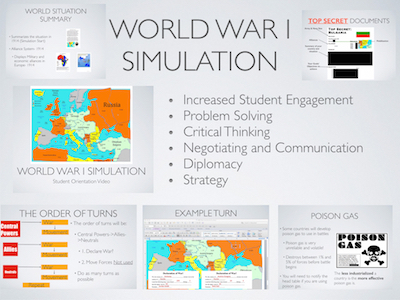 The main focus of the simulation is the interactive map that is projected for the whole class, in which the teacher controls. The map allows the students to see their country, plus others as well. The map is color coordinated to show who is allied with each other and who is neutral, also showing each countries number of troops. 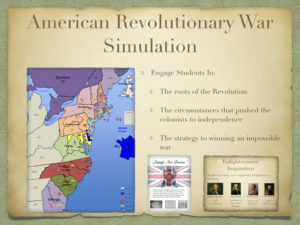 Throughout the simulation the students are informed to the very last day of the war what they are supposed to accomplish. Students, usually in pairs, are assigned to a specific country. The kids are then given a binder with a set of rules, guides for their army, information specific to their given country, and a list of goals to complete before the last round of the simulation. Kids are not only expected to be active in the simulation in class, by participating in the rounds, but they are also expected to do a bit of their own research outside of class. The students should be doing their own research outside of class to have knowledge of the real life event. When the kids do this it gives them the upper hand in the simulation and by having background knowledge you know what you should be trying to do and avoid, similar to that of the real life event. Rather than just going in blind and being completely lost. Kids are also required to keep a daily journal of their information/findings, what happened within the simulation that day, and their own thoughts and feelings regarding the simulation. The World War I lesson plan is meant to be an interesting and interactive time in the classroom. It allows for students to have a healthy amount of competition and fun, while still learning the importance of the topic. When simulation time rolls around the corner, not only does it get the class excited about the upcoming unit, but the whole school is on the edge of their seats to hear about the events taking place. Simulation time is fun for all students and something everyone looks forward to.